Three component anode-cathode protection (electrochemical protection) keeps underground gas tank out from the impact of underground currents (vagabond and induce), it protects metal from corrosion. Thereby it extends service life of the cistern. 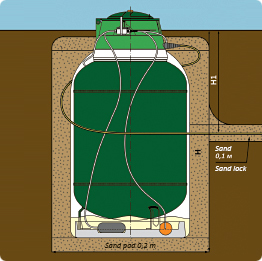 Let’s review the processes which occur with a gas tank under the ground – in contact with the ground more detailed. Underground steel cistern for liquefied petroleum gas storage (; LPG – Liquid Petroleum gas; GPL – Gaz Petroleum Liquide) is exposed to adverse corrosion impact during the operating. The point is that metals and their alloys are destroyed (electrochemical destruction and chemical breakdown) during long lasting contact with the environment: humidity and air. Destructive effect caused by corrosion might be provoked by a variety of reasons: from the disturbance of protective coat to essential temperature differences and vagabond currents in the ground. The result of this continual «attack» is that neutral iron atoms lose their electrons which are transformed into positive ions – this is the way how corrosion occurs. 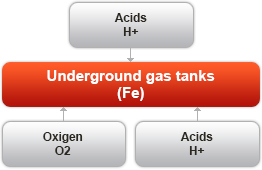 The speed of underground steel gas tanks destruction depends on the type, temperature and structure of the ground; on concentration and composition of the agents; on moisture and air contents; on bacteria presence which speed up corrosion process. Besides that corrosion rate also depends of mechanical stress, damages of metal, temperature drops, specific electrical resistivity and nonhomogeneity of physicochemical properties of the ground and other factors. Underground cisterns for LPG storage are covered from outside by three layers of epoxy protective coat which have corrosion resistant properties and the thickness of 800 microns (standard – 500 microns). The coat is produced by «Carboline» Company which has leading positions in production of protective coats for steel surfaces. 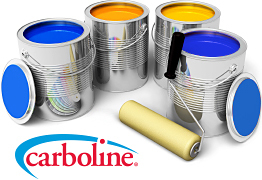 «Carboline» epoxy coat is the most efficient and reliable protection for metal under the ground. The paint whose base is the epoxyde resin is dried in special chamber according to patented technology what guarantees the protection of steel surface of a gas tank from physicochemical impact. Inside surface of the cistern is protected from corrosion by special coat. «Antonio Merloni» gas tanks are made of low-alloyed sheet steel (thickness: 7-10 mm) on special equipments. Production of high quality cisterns is possible thanks to high technological effectiveness of the factory. 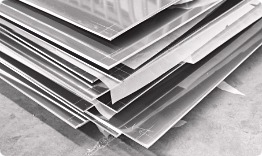 Sheet structures are misshaped and welded by mechanical welding; lower and upper bowls of the cistern are forced on huge heavy presses from the one piece of steel. Low-alloyed steel has advanced specifications and low cold-shortness threshold what guarantees exploitation temperature characteristics lower than -40°С and extended service life of the equipments. The hatch of a gas tank is made of stainless steel. This way of protection is based on the principle of galvanic couples. Connecting steel underground gas tank to metal protector which is more active than iron we get galvanic couple: protected cistern is a cathode, protector is anode. This is sacrificial protection which is called anode-cathode protection. Over electrolyte a contact between different metals is accompanied by the pass of more active metal electrons (magnesium alloy) to less active (iron). Here there is a principle of galvanic activity based on different activities of metals. Therefore potentials difference of «gas tank – protector» system in the chain of galvanic anode system causes the appearance of electric current which affects protected cistern and creates a potential more negative than before galvanic anode system was activated. Corrosion of protected cistern comes down almost to zero thanks to negative potential applied to protected cistern. Connection to protective bag «Marsupio» and activation of three-component protection which consists of two cathodes and one anode is realized in the workshops of Italian Corporate «Antonio Merloni». Accumulator charge will be enough for all operating life of a gas tank. Bag made of strong electrically conducting polymer efficiently protects all the year. Why should we use electrochemical protection for the cistern? Onsite consultation and mounting of gas tank. Gas supply in 1 day.